A prolific painter who favored the watercolor medium during most of his career, Prendergast worked in Boston as a commercial artist before training at the Académie Julian and the Atelier Colarossi in Paris from 1891 to 1894. Upon his return to Boston, he exhibited watercolors of coastal scenes, which he had made both in Brittany and in Massachusetts. The seaside was to be a fertile source for Prendergast's art for the rest of his life. Drawn to the populated urban beaches north of Boston, such as Revere Beach and Beachmont, he found that their working-class promenaders dressed in finery allowed him to engage issues of class and fashion. In this he was an heir to French avant-garde painting of the spectacle of modern life. 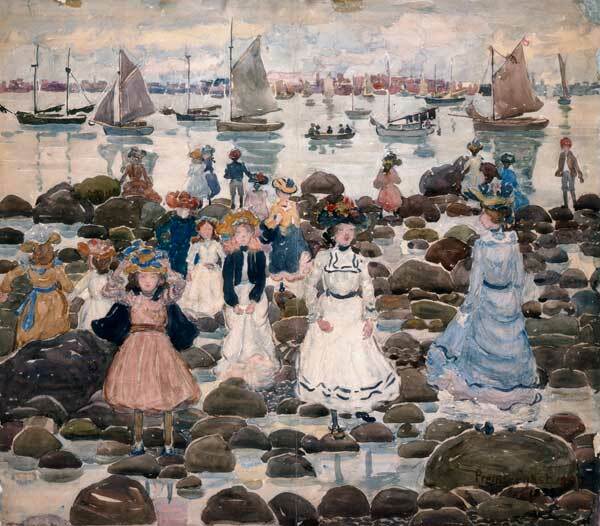 Low Tide, Beachmont reverses the relative importance of figure and setting seen in Prendergast's earlier works: here the people, arranged in rows, predominate. While they are rendered decoratively with little sense of roundness of form, the harbor scene is more lifelike, full of light, atmosphere, and movement. In his daring treatment of the human form, the artist drew on a variety of sources, including Post-Impressionism and folk art.